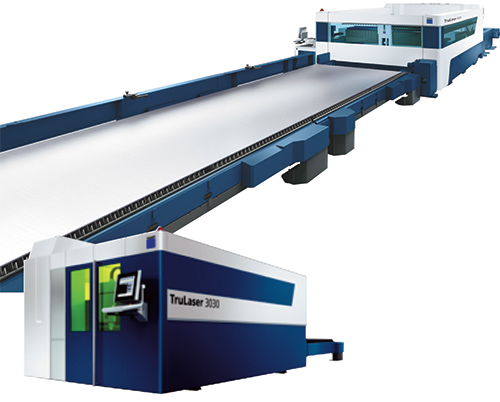 Built especially to handle oversized formats, the TruLaser 8000 laser-cutting machine, introduced by TRUMPF Inc., Farmington, CT, can process sheetmetal blanks to 52 ft. long. The machine proves ideal for companies processing very large parts or for job shops looking to expand their capacities and range of services. Choose among two pallet concepts and six format sizes, ranging from 8 by 20 to 8 by 52 ft. This newly designed 2D laser-cutting machine includes the optional AdjustLine function, which modifies the cutting process using specially developed cutting tables to increase the tolerance for variations in material quality. Also new is the optional CoolLine function, which uses water to remove excess heat created while cutting. With a 6-kW laser, the machine can cut mild steel to 1 in. thick. The high-efficiency cooling unit optimizes energy utilization, as does an updated laser standby mode. When the TruLaser 8000 suspends cutting, power draw is reduced by 40 percent, yet the machine stands ready to resume cutting in just seconds. The LensLine feature automatically checks the condition of the focusing lens, increasing service life and eliminating unnecessary cleaning cycles. Also new from Trumpf is the TruLaser 3030 fiber, a solid-state laser-cutting machine boasting 3 kW of power and a 1-micron wavelength. It can cut mild steel to 3⁄4 in. thick, 5⁄8-in. stainless steel and aluminum, and 1⁄4-in. copper and brass. Its universal cutting head can process all sheet thicknesses, avoiding the need to change processing heads between applications. Trumpf introduced the TruLaser 3030 fiber to the North American market at the Canadian Manufacturing Technology Show, September 30-October 3, 2013, in Toronto.